It's been tough trying to get this video filmed today! I recorded the other videos outside (for the great lighting and acoustics), but we spent the morning in town at the vet and when we got home it was already 100°. Sorry, but that's too hot for me to sit outside in the sun and sew. I tried unsuccessfully setting up at multiple windows around the house and when I finally found the best light, my neighbor started mowing. My camera picked up the drone of his mower, so I had to stop. I resumed filming when he finished, but then he started his weed eater! I think he was weed eating off and on for almost two hours! Every time I thought the coast was clear... weeeer, weeer, weeeer! 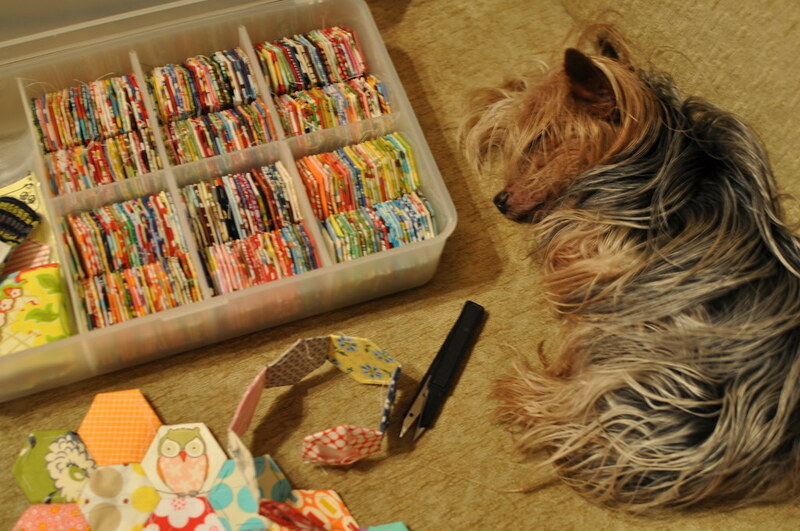 I wanted to go yell at him, "Hey, buddy, I'm trying to record a little sewing video in here!" But, of course, I didn't. So, this video may seem a little choppy because it was filmed at different times throughout the day and then spliced together. The lighting isn't very good and portions are a little out of focus, but I think you'll get the idea. This video is how I piece my strips of hexagons together. Its isn't necessarily the right way and it's definitely not the only way, but it's what has been working for me. It might be helpful if you are new to hand paper piecing. Thank you for all of the love on the Color Wheel quilt. I might hang it on a wall; maybe in my new sewing room. Regarding the hand quilting video, I'll try to record something when I start on the paintbox quilt, but I'll be using Perle cotton for that project, so it's slightly different than traditional hand quilting. Amy has a fabulous series of videos on YouTube on hand quilting, so be sure to check those out. Vikivictoria also shared a video link that I found helpful. Thank you! We had a little dog-related scare late last night. My 13 year old Yorkshire Terrier, Gizmo, has cataracts. That's her snoozing on the sofa above. She can distinguish light and dark really well, but she's basically blind. Our vet watches for complications, but says she's too old for major surgery and I'm too cheap to spend $4K on surgery for my 13 year old dog. Anyway, last night one of her totally white eyes (cloudy from the cataracts) turned blood red. A blood vessel in her eye ruptured! I could tell she wasn't in pain since she wasn't pawing at it, but she was bumping into things like it worsened her already terrible vision. We saw the vet first thing this morning and he said she was going to be okay. After fewer than 10 hours on steroid drops, her eye already looks much better! The poor old girl looked terrible and it was scary because I didn't know how serious it was. I'm thankful she's on the mend. Speaking of pets, we have a new one. This is Coconut. He's Shea's new hamster. She is enjoying his company immensely! Your video turned out great-I would never know you encountered so many problems! I'm surprised they didn't turn the leaf blower on next! Awesome video! I think it came out great. That's scary about his eye. :( My elderly cat Mooshie is starting to get cataracts now. Not sure what we are going to do about all the stairs in our house when they get really really bad. Yay, the video was perfect and answered all of my questions regarding the piecing of the rows!! Thank you, thank you, thank you! As for Gizmo, poor little doggy. I'm glad to hear that she is doing better. 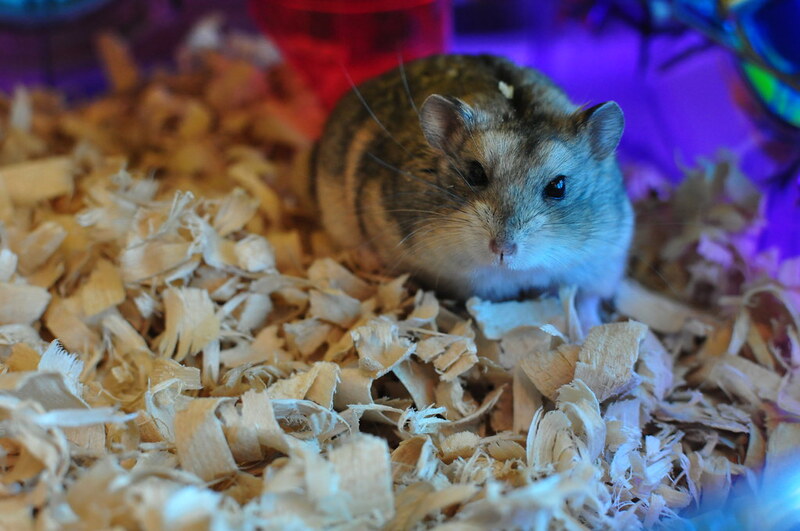 And Coconut is such a cute hamster! How fun for your daughter! I'm so glad your bubby is going to be okay and Coconut is adorable. Excellent! This is what I'm about to start with my 2" hex quilt. I'm going to follow your lead. What a great post! I love the hexagon video and you've edited it so well. What program did you use to do that? It is very clever. Cute hamster too...that last picture is adorable! Thank you SO much for this video - this makes so much more sense now, I am a spanking brand new hand piecer - and strips is the ticket! Thanks! 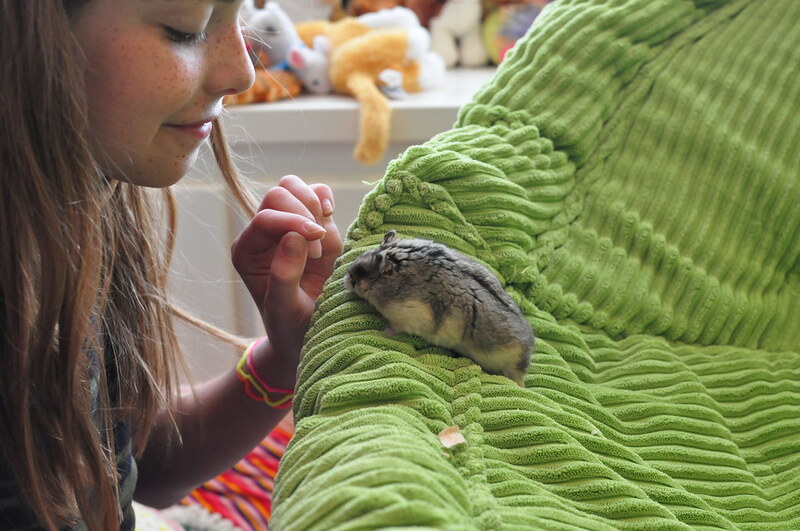 I love your little hamster too - so cute! Thanks so much for the video. I'm still in the process of basting mine together, and you know how your mind always runs ahead - I was thinking of how to put them together. Your video came out just in time!! Thank you! great video!! couldn't even tell you spliced stuff together and I didn't notice any out of focus issues!! thanks to you....now I'm going to have to start doing hexies!!! I used to do the hexagons with the plastic hexes and the fabric cut in the shape of the hex. Frustrating. Fabric slipped. I quit. This morning I tried your method. Love it. I'm a fan! Great video, thanks! I've really enjoyed watching your hexing these past few weeks, and I just learned paper piecing at a craft party over the weekend! Yay! Thank you very much for your videos. I have never been interested in paper piecing. I found your blog and was reading about the hexagons....I made a few of them and I am hooked now. I was looking for something to do while I watching tv. Have you ever done a grandmothers graden block with the hexagons....I think I would like to try that....again thank you for the videos..they helped me a lot...you do a great job. Thanks Melanie for another wonderful tutorial! I'm so impressed with all of your beautiful hexagons. I'm so happy your little dog is doing well. Cute hamster! And so glad your dog is ok.
Great video! You'll be happy to know that after having your blog open on my computer for about a week, I finally printed off a page of hexies today and made 10 copies. Tomorrow I'll cut them out and get my little kit started. So excited! Now, how to go about getting all the different fabrics? How do the charm pack swaps work? Our shepherd cross is blind too. Sad to see, but she's adjusted well. My sister and I had 3 of those little hamster's. We loved all of them, they are so little and so fast. Ours lived in a 50 gal fish tank (the long skinny ones) that we lined with paper towel tubes and toilet paper tubes for him to run through. Enjoy your new family member.